Go to "Gloria's Birthday Blog Hop" HERE~! There is a giveaway you might want to check out! Good Morning & welcome to our "Love Your Pet Blog Hop"! If you just arrived here from Miss Erika's blog, then you are headed in the right direction! The reason for today's hop is every year the ASPCA has their "Prevention of Cruelty to Animals" during the month of April and encourage people to "Go Orange for Animals"! I'm not sure about any of you, but whenever I see a stray animal, I am ALWAYS the one to pick it up & find their owners! I know if I don't do this, I am ALWAYS afraid that someone who isn't pet friendly might get ahold of them 1st & abuse them:( I see too many stories on animal cruelty & it just breaks my heart! So this is why I chose to do this hop because my furry babies mean the WORLD to me & I will do anything for them to make sure they are always protected! Here is my video showing you how I designed this SIMPLE page! If you get lost along the way, here is the blog hop order! Emma http://www.creativetimeforme.com/ you are here! How cute is this! Love the adorable doggie bones and cute pics. My sweet doggie went to heaven in January. I miss her sweet face. I LOVE how you used this stamp set on your LO!!! It came out perfect!!! Thanks for doing this hop with me!! This layout of your doggie is so adorable. Love it. Very nice layout. Your babies are very cute. Aweome layout! Love the blue to brighten it up!! Very very cute! Your layout turned out awesome. Love the "two cute" with the two dogs together. Love this layout! It highlights your photos so well!! I love your layout and the colors you picked!!! Your "kids" are just the cutest! How adorable your fur babies are! Great LO to show them off in too! TFS! I love the layout! It's simple, but has a lot of nice layers to it, and so very sweet. Thanks for the layout idea. I like seeing how the stamps are used on these! adorable layout, love my Syd just like one the kids too! Love your fur baby layout! Nice to know other animal lovers out there. What a delightful layout, Emma. Pets sure do pull at our heartstrings! Thanks for sharing! this is adorable! We lost our baby, Ladybug, about 3 yrs ago. She got really sick and we had to put her down. We just recently started thinking of getting another puppy. My boys (4 of them) would LOVE him/her! This page inspired me to make a page for our Ladybug!! Thank you Emma! emma, I love your layout. It is too cute. My puppy is a baby, and my parents call him their grandpuppy. I also have had him go to his their house for puppy sitting. Your baby's are sooo Adorable!I love your LO and Stamp set,Great job! !My Bday is coming up and I asked my fiancee for a puppy.Hope I get one !!! Love the layout, nice giveaway (love the superman symbol)!! Emma....that is so adorable!! What a great layout!! Our furbabies are a great inspiration.Has anyone noticed that most crafters also have pets lol. Love the bones and buttons in the corners. such a cute layout! Would love to win! I love how this turned out Emma!! Thanks for sharing. I love this stamp set!! Love it ! Love the stamp set you used. Adorable layout Emma. Thanks for the inspiration. What an awesome layout!!! LOVE the colors - and that stamp set is PERFECT for you other little babies!!! Aww! Your layout is so cute! I have to admit that now that my son is almost 18 I scrap alot of doggie pics! Thanks for the great giveaway! Thank you for sharing Emma! So very cute and I feel the same way you do about My fur babies!! Thank you for being part of a very Important blog Hop!! Your layout is adorable. I love my pets. You can always count on their love. Your stamp sets rock! Look at you! You are on a roll with your scrapbook pages! This one is too cute! I love that paper stack and how you made the plaid bones. I never would have thought to do that, and they are adorable! 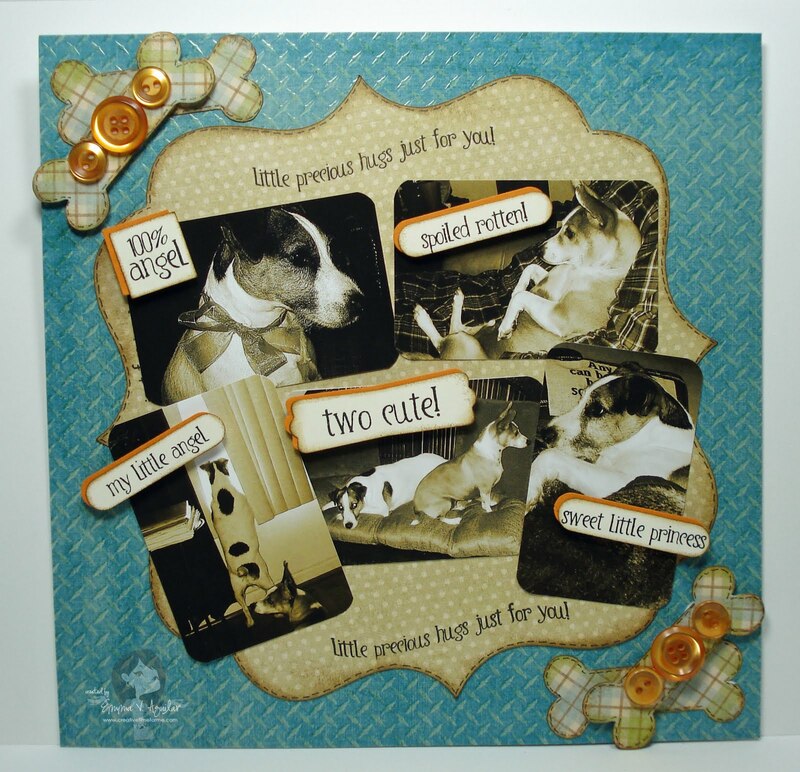 Your furry babies are precious, and the stamps are perfect with them! Adorable LO! Love the bones! Ah, what a sweet layout of your fur babies. And I love the name Scrappy. Too cute! Thanks for sharing. Super Cute LO!!! Love the pictures very cute!!! Very cute!! I'm liking this pet blog hop...something different & fun!! Love the layout. Thanks for the video! Those stamps are perfect too. You're layout is adorable just like your puppies!!! thanks for sharing and thanks for the chance to win! this is adorable emma... and LOVE that stack!!!! it is yummy! I know the felling about loving pets. I have 6 Shih Tzus. I need a 12x24 when I do their layouts!!! What fun. OMG! Your layout is so cute - as are your doggies! I love the pix of the one propped up on the sofa--too adorable! Thanks for a chance to win your great stamps!--Pat N.
I love how this page for your fur babies came out to cute. I would love a chance to win this set of stamps. They would be perfect to use with pictures of my fur baby as well. Love your scrapbook layout! It is so cute! Emma! I am so the same way I want to keep all strays! I have a Vet for a BIL so unfortunately I hear some of the worst stories but I hear good stories too. There are a lot of people out there who worship their little fur babies! I have seen it in older people and it just brings tears to my eyes thinking about them and the way they love on them when they pick them up after only being groomed for an hour. I have to remember stories like these to not think of the terrible ones :( Thank you for the chance to win I LOVE your stamps! So Cute! I love Dogs especially little puppies. How sweet! Love the dogs! Great page! Thanks for the video. Gotta go find that paper stack. You have the best videos and I love the cards and layouts. I would be honored to win one of your stamp sets. Keep up the great work. Love your layout Emma! Your fur babies are adorable! Such a great LO! I love to scrap my furbabies to. Great layout! I esp. love the picture under My little angel. Too cute!! Great Hop!! Enjoyed it very much!! Thanks for sharing and the chance to win! Cutest layout and cutest doggies. Love this stamp set. Thank you so much for the chance to win it. Great page! Love to show our love for our pets. They are family too! Hugs. Got to love Angel and Scrappy :D Your page is super sweet. Your stamps worked perfectly for your furry babies. Thank You for sharing in the hop. This is lovely. I feel the same way about my babies. Even though they are dogs they really are my babies. I don't know what I would do without them. What sweet little babies you have! I love the little dog bones on the LO. Is that a Jack Russell? I have one of those and he is a handful and a half. Max is his name. Super layout. I love your doggie photos. Great job! OMG your page is so cute - simple but with so much charm - as I type one of my furry babies is sitting right next to me - and she would love it if I won one of your stamp sets!!! ADORABLE!!!! I love the puppies :) So precious!! cute layout your babies are adorable. How cute! Your dogs are adorable! I love your stamp set Emma. This is a wonderful hop for a good cause. I am an animal lover from the get go. Just hate to see animals that are not being taken care of. Unfortunately there are to many people who have pets but don't take care of them. Love how your stamps go along with the layout! I love the page. It's so simple and yet really well done. Your fur babies are too cute!! Thank you so much for your inspiration! I love your projects that you make! Adorable lay-out! And super cute photos! What a sweet lo! If yhey could, I'm sure Angel and Scrappy would be doing a happy dance for you! Love your layout!!! If I don't have Lacy Labels what do you suggest?? Great tutorial & layout. Cute furbabies too. TFS! Love the doggie bone embellishments! Cute layout and I love the stamps you used. Just awesome. I'm so loving the 8x8 pages too. Thanks for sharing. the colors and the pics are so adorable!! oohh.. I would so love to have that most wanted stamp set!! Thank you for your great inspiration. I needed a pick me up on some new ideas for my gypsy. I absolutely adore your layout. Your layout of your puppies is fabulous! I love the black & white photos. Awwwww . . . your puppies are adorable! I love your pet page, so much imagination is being used and the stamps are the best. Wow, you are extremely talented! I love my little doggie and she has rescued me after brain surgery. What a cutie. Great layout. Your furr babies are so sweet....love your layout! Great layout. I just finished one for my daughter for her furr babies. I will have to make one for our furr baby now. love your layout! thanks for the chance to win! Sooo cute, love the patterned dog bones and the buttons! Great project! Love your colors! love any layout that deals with dogs!! Love it! thanks for sharing. LOVE the layout! I have a furbaby too and just can't imagine anyone treating any animals poorly. Thanks for sharing! Cool layout. I scrapbook 8 1/2 x 11 most of the time. So cute Emma! Love all the stamps you used! Awesome! I love watching your videos and the end product is always so cute! Thanks for the chance to win your stamp set. I have a couple sets and it would be quite a treat to win one. Emma, your layout is adorable and so are your fur babies! I have 2 greyhounds and 3 cats that I adopted from different rescue groups and have done volunteeer work for the Humane Society and the local Greyhound rescue group. Our pets are such an important part of our lives and I don't understand how anyone could cause harm to an innocent animal. Thanks to all of you for doing this. I love all of the projects for the hop, and I love my puppy. Thanks Emma for the inspiration. Gloria C.
Cute way to add the buttons!!! Your LO is so adorable! I love the page. Mickey's ears are adorable. Thanks for the chance to win. You are very creative. I've made scrapbooks of my dogs and I can't wait to post them soon. I make a scrapbook for them every year.